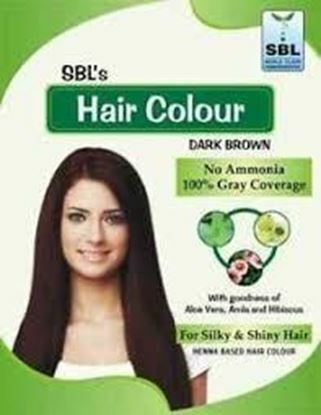 Information about SBL Hair Colour 12 Sachets Dark Brown SBL Homeopathy Hair Colour 100% Quality at Every Step. No Ammonia. SBL's Hair Colour made from henna leaves and rich natural Indian herbs are ideal for hair colouring & conditioning. It provides nourishment to the hair, making them dark, shiny and soft. Key Ingredients of SBL Hair Colour Henna Powder, Sodium Perborate Monohydrate, Para-Phenylenediamine, Sodium Carboxy Methyl Cellulose, Tartaric Acid, Sodium Lauryl Sulphate, Sodium Sulphite, Amla Powder, Dry Extract of Aloe vera, Hibiscus Powder. Directions for use of SBL Hair Colour To get the best result SBL's Hair Colour should be used in a proper manner as follows Wash hair with shampoo making them oil-free and dry. Mix the color powder of one sachet (8g) in 40 ml (8 teaspoonfuls) lukewarm water making a fine paste. Apply it immediately using brush ensuring that it has been applied to the hair evenly. Comb through the hair so as to enable the paste to reach the roots of the hair. Allow it to dry for 30 minutes the hair thoroughly with lukewarm water. SBL's Hair Colour provides nourishment & conditioning along with deep rich color. 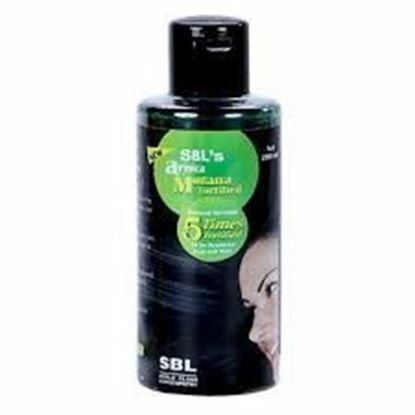 Information about SBL Arnica Montana Fortified Hair Oil SBL Arnica Montana Fortified Hair Oil is non-sticky & non-greasy oil, specially formulated for rejuvenating the scalp. It improves blood circulation & stimulates hair follicles for better growth. It checks dandruff, curbs hair fall & removes scalp infection. Composition: Extracts of Arnica montana (50% w/v), Calendula, Cinchona, Jaborandi & Thuja. How to use: Use your fingers to gently massage the oil into the ends of your hair, then starting from the ends and working your way toward the roots – gently work out tangles with a comb or hair pick. Keep this oil for at least 2 to 4 hours. Avoid rubbing your hair with your palms as it can break the hair.Massage with oil for almost 10 minutes it will help in improving blood circulation in your scalp area.